MOSCOW, October 5. /TASS/. 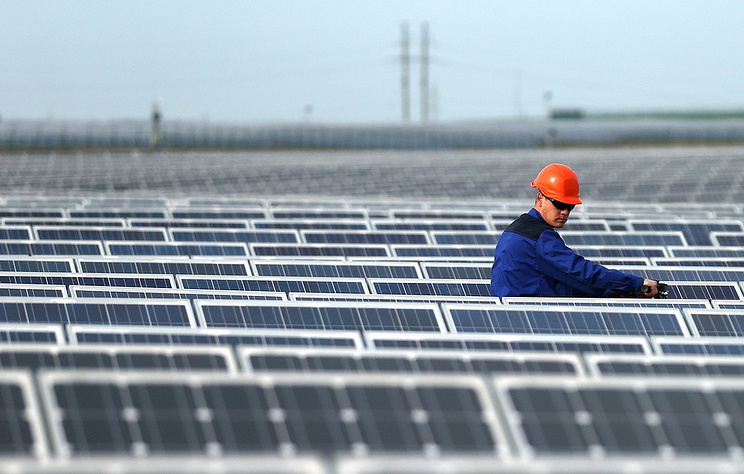 Russia has started exporting locally-produced solar panels, First Deputy Energy Minister Alexey Texler said on the sidelines of the Russian Energy Week on Friday, adding that first batches have already been supplied to Europe. "Export supplies have been started already, particularly from the Novocheboksarsk plant to Europe," he said. Russia is currently implementing a program in support of renewable energy planned until 2024. Texler said earlier that the extension of the program would also help power engineering companies, particularly to launch equipment exports to international markets. The official considers it necessary to make sure that solar panels and wind-driven electric power stations produced in Russia become an out-bound product highly-demanded in the world. Russian Energy Week 2018 is taking place in Moscow’s Central Exhibition Hall ‘Manege’ from 3 to 6 October. Its top goal is to demonstrate the prospects of the Russian fuel and energy industry and unlock the potential of international cooperation in the energy sector. The forum serves as a platform for discussing the main challenges faced by the energy sector and topical problems involving the development of gas, oil, coal industries, petrochemistry, electricity, and energy conservation and increased energy efficiency, as well as best available solutions. TASS news agency is the information partner of Russian Energy Week.